Buy a Taco Bell $5 box and get a chance to win Sony's new handheld. Sony isn't exactly selling Vitas like hotcakes in Japan. This week, the new PlayStation Vita placed fifth in the hardware sales chart behind Nintendo's 3DS, the 6 year old Wii, and Sony's own PS3 and PSP. That's right, the unit the Vita was meant to replace sold better in Japan last week. Sony doesn't want such meager sales to continue in its February worldwide release so how do they plan to bolster confidence in the PlayStation Vita? Why, promote it through the purchase of Cheesy Gordita Crunches, of course. Here's the brilliant scheme. 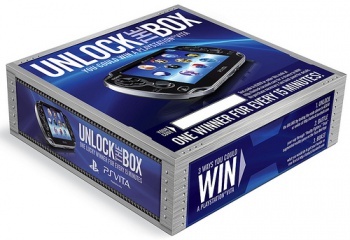 If you buy a specifically labeled $5 Buck Box - which happily contains meat, cheese and tortillas in various combinations with high fructose corn syrup - between January 26 and March 11, 2012 you will get a code that you can enter online to win a PlayStation Vita. You will also be able to go online and battle your "friends" in Reality Fighters Dojo for a chance to win. Barring that, you can record a video proclaiming to the world all you would do to earn a PlayStation Vita. Such videos will be posted and users will vote for the most entertaining boast. Predictably, the winner will get a PlayStation Vita. I'm as happy as the next guy to gorge on some tepid "tex-mex" slathered with Fire sauce, but I don't think I'll be schlepping down to Taco Bell just to get a PlayStation Vita. Am I crazy or is Sony betting a little too much on the fast food/gaming connection?